An astrologer told me once that my mothering streak is too strong to not have a child. Since then I’ve oscillated between excitement and total panic every time I think about looking at my horoscope. Somehow, I always end up being that adult at gatherings having a tea party with the 4 year old, talking to the 9 year old about the universe, or walking around with the babe in arms singing silly songs about cows. Why? I don’t know, blame the stars. Being the mom-type to a bunch of single 20-somethings admittedly isn’t the same as being a mom, but that doesn’t stop my curiosity about baby-stuff one bit. What are these little aliens, where do they come from, and most importantly, what do they need to eat to be healthy? (Okay, well, I know that they’re not aliens, they’re actually just brand new humans with tiny little fingers and we all learn where they come from at a pretty young age, but what about their food?) Not being a mommy, I had to do the research. And what I found out about commercial baby food is more than harrowing. As with many food products on the market, the commercial industry has thrown health by the wayside and decided to focus on “the most important thing”: the bottom line. 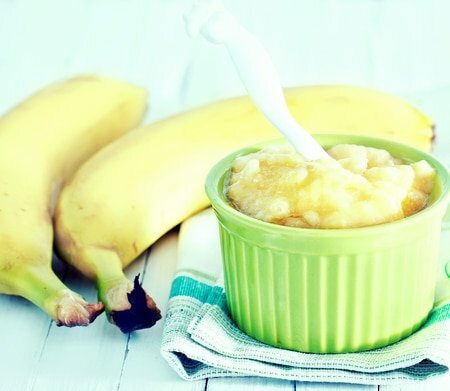 What's in Commercial Baby Food? It turns out that commercial products are essentially water laced with sodium, sugar, starches (including those that contain gluten), thickening agents, and synthetic vitamins that are hard to absorb. Often, the ingredient advertised on the label makes up less than 10% of the entire jar of baby food. The fruits, veggies, and proteins themselves are often what’s called “baby grade.” I couldn’t find a definitive answer about what that means, but given that genetically modified apples were just approved to be safe for sale in our country, “baby grade” could mean anything. A lot of baby foods can sit on the shelf for longer than most babies take to mature. That’s because all of the ingredients are heated to extremely high temperatures to kill off any and all bacteria in the food, effectively killing the good bacteria that the babies need to populate their little bellies. What is this madness? Profit. Evidence shows that what a baby eats in the first stages of life can set the tone for her eating habits throughout her lifetime. With that in mind, what do you think about starting life with food that has little to no nutritional value plus high sugar and sodium content? With childhood obesity, diabetes, leaky gut, gluten intolerances, attention disorders and other (previously rare) developmental issues rising at an alarming rate, I’d say that healthy eating from day one is of the utmost importance. The good news is making your own baby food is cheaper and healthier than buying the commercial stuff. I reached out to Lisa and Annmarie, our mommies on staff, for their best feeding advice and favorite baby food preparations! Aside from sending me this adorable throwback video from 2009, they both had some great advice for the first year of baby feeding! What Should You be Feeding, When? There’s a lot of literature out there about when to start feeding solid foods to baby, almost too much. I asked Annmarie for a few reliable sources and she told me that Nourishing Traditions by Sally Fallon, nourishingourchildren.org, simplybeingwell.com are three wonderful resources that she turns to again and again for advice. Both of the ASC mommies said that breastmilk is the ideal form of nutrients for the first year of a baby’s life. When they are sitting up completely on their own and they aren’t spitting out everything in their mouth, they’re ready to start trying out some solids. For Annmarie, knowing that her baby is getting most of the nutrients from breastmilk lets her have fun with the solid food and make mealtime a positive family experience. The most important part of introducing foods to baby is to do it early in the day and try each food out alone for 3-5 days just to make sure that they don’t have any allergies to the foods they’re eating. Of course, you will want to make sure that you feed your baby organic, non GMO foods if you can. Genetically modified foods have been linked to many allergies and progressive health problems so we encourage organics for the new baby tummy. The number one thing to start with is water— it makes up about 75-80% of baby’s body so baby knows it well. Bone broth is full of proteins and minerals, is easily digested, and tastes delightful for baby! Annmarie started with bone broth and is happy that she did! Introducing fats (like coconut oil and butter), proteins, and veggies into baby diets first is a good way to get them used to the savory food flavors. Babies will always gravitate to sweet foods because breastmilk is very sweet. Fruits are very sweet, so introducing them first could make it difficult to feed savory veggies to the youngins. Sweet potato is a great starter because it’s a little bit sweet and it’s a great source of fiber, vitamin B6, and potassium. Green Beans are very earthy and a wonderful source of vitamins A, B, C, and K and minerals like calcium! You can do the same thing with many other veggies—carrots, spinach, and beets are all fabulous. Once you know that your baby isn’t allergic to more than one of the vegetables you can blend them together and make very special entrees that will give your baby a variety of nutrients. There are some foods that are good to avoid with baby until after the first year has gone by. Wheat, oats, nuts, soy, fish, honey and cow’s milk are all on the list of things to avoid for the first year. They can be allergenic and/or cause problems with baby’s digestion. For a more specific list, check out one of the sources that Annmarie mentioned above! Annmarie also made a note that when you do start feeding grains to your kiddo, it’s really good to soak it in lemon juice or kefir first so that it will start the digestion process before baby gets to it. What are some of your favorite baby food recipes and baby books? Let us know in the comments below! I also agree with starting with veggies, to avoid baby developing a preference for sweet foods that definitely is VERY hard to turn around later! And the natural ‘raw’ baby foods, banana and avocado – such great recommendations. These are easy for us moms and easy on babies’ tummies! P.S. I am loving all of the amazing ‘kitchen remedies’ on your blog! I will be sharing your tips/articles for sure! I agree with starting with veggies, once they have lots of fruit it can be hard to switch. When introducing fruit, pear is the least allergenic so best to start with that.